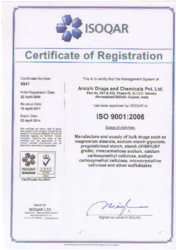 Established in the year 1983, Amishi Drugs and Chemicals is a renowned manufacturer, importer, exporter and supplier of drugs & chemicals such as Pharmaceutical Drugs, Pharmaceutical Health Drugs, Pharmaceutical Bulk Drugs, Sodium Carboxymethyl Cellulose, Microcrystalline Cellulose, Calcium Carboxymethyl Cellulose, Silver Sulfadiazine, Crosscarmellose Sodium, Sodium Starch Glycolate, Die - Press Starch, Magnesium Stearate that are specially used in the pharmaceutical sector. The drugs and chemicals offered by us are appreciated throughout the national and international markets for their accurate composition and quality, which has been a reason for the steady growth of the company over the years. We export our products in all over the world. Our range is sourced from reputed vendors and is checked thoroughly for purity at our in-house testing facility. A team of Quality Auditors thoroughly inspects the procured chemicals for pH level, purity and chemical balance. We carry out the packaging and storage operations very meticulously, to ensure that no losses or damages are incurred. The product line has been endowed with many Certificates by national and international Quality Control Bureaus. These chemicals are well accepted in the national and international markets, and find their use in diverse industries, such as pharmaceutical, packaging, textile and textile industries, among others. I am here by confirm that I have visited the factory of M/S. 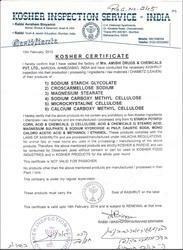 Amishi Drugs & Chemicals Pvt Ltd. have conducted the necessary kashrut Inspection in to their production. We are a premier organization having almost three decades of experience in manufacturing, importing, exporting and supplying of drugs & chemicals that are specially used in the pharmaceutical sector. We have been awarded with multiple quality assurance certificates. The raw material used in the processing of these chemicals include high grade pulp, starch and stearic acid. These compounds are checked on several parameters, such as pH level, purity and accuracy of composition. We also offer customized packaging of 25kg to our clients, which is only done in paper bags, fiber drums and HDPE drums that are appropriate for the respective chemicals. The excellent product line and services have propelled us to the present position in this highly competitive market. We have a talented team of professionals, who work diligently to offer our valued customers premium quality products. Our professionals have rich industry experience and are the best in their field. They continuously try to improve themselves and this has propelled us to our present position in this highly competitive and dynamic market. It is only due to the tireless efforts of our team that we are able to offer the clients products that are at par with international merchandise.